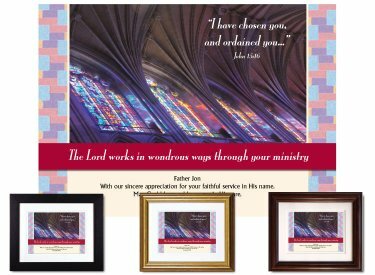 Whether it's Pastor Apprecation Month or any time during the year, this personalized plaque is a wonderful way to convey your thanks. It features this excerpt from Scripture: "I have chosen you, and ordained you..." Imagery is some of the beautiful upper stained glass windows and soaring, ornate ceiling at the Washington National Cathedral. Framed & Finished - Printed on premium paper with archival inks and double-matted with conservation-grade matboard as above; mounted using acid-free foam core backing; framed using distortion-free UV acrylic glazing. A protective dust cover and wall guards are applied to the back. Your choice of black, gold or walnut wood frame (view frames here); ready to hang. Finished size: 10"x12"